Every other time I've headed to the hushed beauty of the Sun Yat Sen Gardens in Chinatown it has been to enjoy the serenity and pristine silence of this man-made oasis in one of the oldest part of downtown. The Sun Yat Sen Gardens is a place for reflection, for tourists, and on this occasion the scene of this year's Vancouver F/W Fashion week. Dressing for Fashion week is a difficult thing. Imagine that dream where you show up naked to prom and you'll begin to understand the awkwardness one enjoys when arriving. I tried to live up to it by opting to dress bizarrely, by wearing a clash of patterns which I will reveal in an upcoming post! Luckily I didn't show alone, but with a bevy of my fellow bloggers! For someone like me who is a perpetual "hover by the punch bowl" kind of girl, having that type of security made me much less anxious and I was able to concentrate instead on more important things - like the clothes. 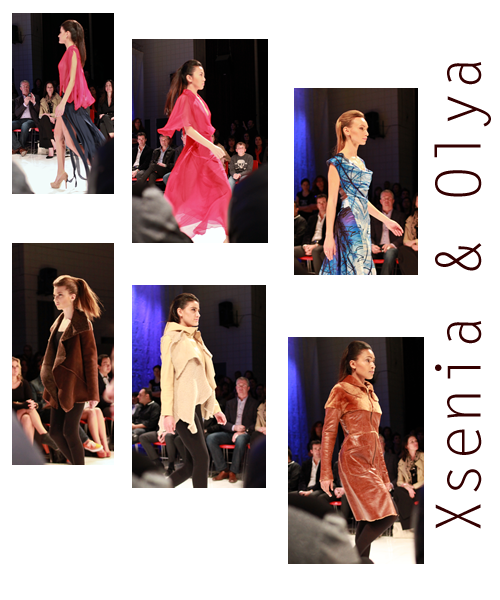 The first show I saw was Xsenia & Olya. It was a great way to open the hour-late show with its vibrant mix of colors and textures. Although the theme of the week was Fall/Winter wear, half of Xsenia & Olya's show featured floaty evening and party dresses done in bold geometric prints and some serious color blocking. Loved the rippling nature of a particular black skirt ripped into strips that floated by me. The second half of the show was dominated by more appropriate outerwear. Perhaps the design duo visited an Alaskan hunting lodge as they took the fur and leather trend to heart, sending down jacket after jacket that looked more like "pelts" than "coats". Next up was Korean line Ha: Seng Beg. If you have never checked into Asian fashion before then you would have had your eyes (and ears) blown out by this show. The music was extremely loud to the point where it literally made your ear drums hurt and the fashions were the same "feast" for the eyes. On a certain level I loved how in your face and just fun it all was. It was extreme for Vancouver and I think we need a little thumb poked up our sometimes pretentious asses. I wouldn't be surprised if body harnesses made their way into Aritzia in the next year. Rating: turn down the volume on the music, not the clothes. 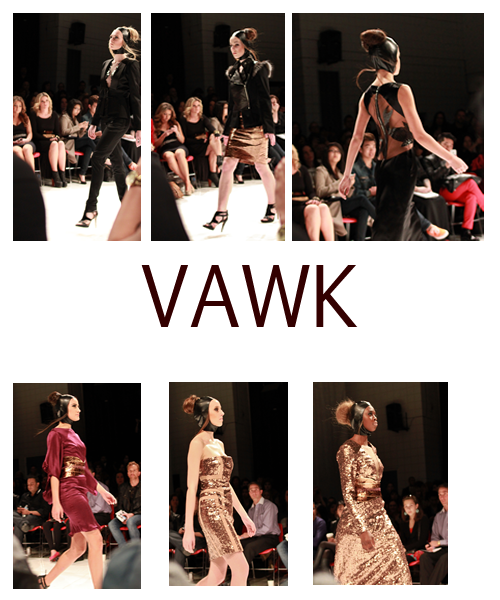 Last, but certainly not least, was the impressive VAWK show. Hailing from Toronto, designer Sunny Fong showed us that Vancouver fashion still has a long ways to go with his gorgeous luxury womens-wear. VAWK was all about tailored blazers, sharp shoulders and gold gold gold! As a gold lover myself, you can imagine how much I loved this collection. Fong also keeps it real by putting in subtle touches to his Asian roots with some beautiful paneling on the back of gowns and with a modern metallic gold twist on the traditional obi belt. Which of these designers is your favourite? My ears were ringing from the Ha Seng Beg show even after I got home.